The new Jeep Cherokee is available in six trim levels available for drivers in the Corpus Christi area, including the entry-level Jeep Cherokee Latitude. This SUV starts affordably priced, seats up to five, and can tow up to 2,000 pounds. Sound like your next Jeep? Take a look at our Jeep Cherokee Latitude inventory for sale in Aransas Pass. 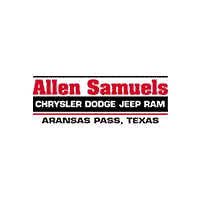 Why Buy a Jeep Cherokee Latitude from Allen Samuels CDJR Aransas Pass? The new Jeep Cherokee Latitude is equipped with a standard 2.4L I4 MultiAir® engine that pairs with a nine-speed automatic transmission and has standard front-wheel drive. it features at 12-volt auxiliary power outlet in front as well as a 12-volt cargo power outlet, and it offers a maximum cargo capacity of 54.9 cubic feet. You can also take advantage of the Uconnect® 4 infotainment system with a 7-inch display and trailer sway control to safer transportation when towing from Kingsville to Port Lavaca. After you’ve taken a look at our Jeep Cherokee Latitude inventory online, see how it compares to the Ford Escape and Mazda CX-5. Then contact us with any questions you have about this SUV or visit us in Aransas Pass to take it for a test drive.